VIRGINIA — People and Planet First leaders gathered to build a long term strategy to grow their base of low-income people and communities of color in the fight for climate justice. Since its founding, People’s Action Institute has been organizing to address the climate crisis and put people and planet first. In 2018, climate organizers came together and co-created the next chapter of our work: the 100% Just Campaign, which will launch publicly in Spring 2019. There is momentum around the push toward 100% renewable energy sources—we want to add energy to that push. We also want to be 100% sure that equity runs through the transition to a renewable energy economy, and that all extractive energy systems are stopped. So what does a world with 100% just energy systems and economies look like? Our goal is to advance a 100% renewable energy economy with equity baked in from conception to implementation. Our plan is to launch campaigns in cities and states that advance this goal. Plus, we plan to organize around and elevate the Green New Deal in the public debate that will surround the 2020 presidential primary. Here is a look at what we are organizing on the ground to bring this vision into reality. 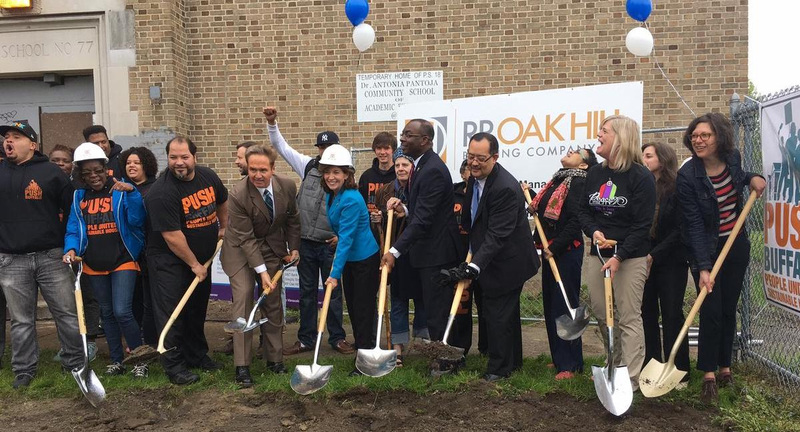 BUFFALO — Breaking ground on the School 77 redevelopment project. 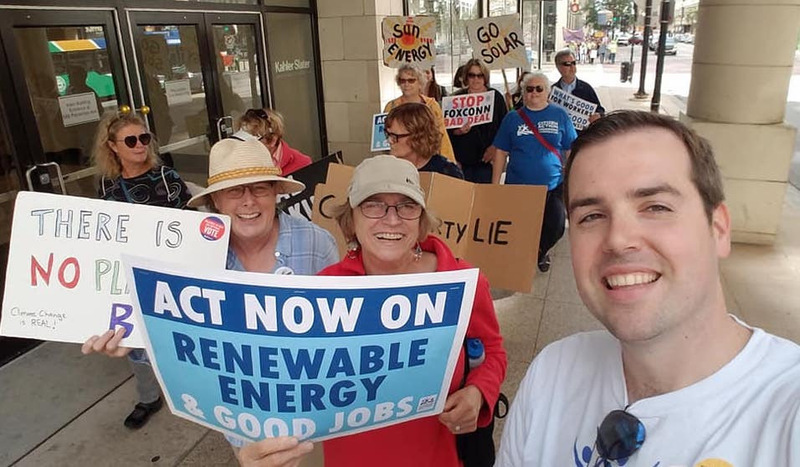 WISCONSIN — Citizen Action members marching for a 100% Just energy and jobs program in September 2018. Read the headlines about a Green New Deal bill in Congress? Citizen Action of Wisconsinhas big plans to pilot a city-level version of the policy in Milwaukee, WI. Citizen Action will run and win a campaign to pass and fund municipal legislation to create a community-backed plan to power the city on 100% clean energy while creating 100% good, green jobs in communities of color that need them most. BATTLE MOUNTAIN — Joe Holley (current Te-Moak Tribe Chairman), allies from Great Basin Resource Watch, and PLAN leaders at a site visit to the Tosawihi Quarry Complex, which was constructed on top of a a sacred site near Battle Mountain. The Progressive Leadership Alliance of Nevada (PLAN) is building a base of indigenous leaders in Battle Mountain to find equitable paths to ending local economic dependency on the mining industry and build a renewable infrastructure in its place. Their groundbreaking—or, more accurately, groundsaving—work will center the leadership of Nevada’s 27 tribes in the fight to bring the state to 100% renewables by 2050, and provide a model to the nation for rooting climate justice in indigenous sovereignty. 19 of our member organizations are fighting for energy justice. 11 of them are fighting corporate expansion of mining, pipeline, and refinery operations in their state. 10 groups are introducing, lobbying for, or improving game changing legislation that would move the state to 100% renewables in a just and equitable way. 3 organizations have won energy policy fights and are focused on just implementation of a clean energy transition, with a focus on jobs and benefits for directly impacted communities. Curious about the details of our energy work? Click the button below to reach out to People and Planet First Director Rae Breaux for a copy of our report on state-based energy justice organizing. Looking for something to listen to on your commute home? Earlier this month, MSNBC’s Chris Hayes invited People’s Action Institute Executive Director George Goehl to talk about our organizing work in rural and small-town America on his podcast Why Is This Happening? With Chris Hayes. The full transcript is available on the show’s website, and you can listen to their conversation on Apple Podcasts and Stitcher. From the Front Lines is published quarterly by People’s Action Institute. Want to hear more about these stories from the field?